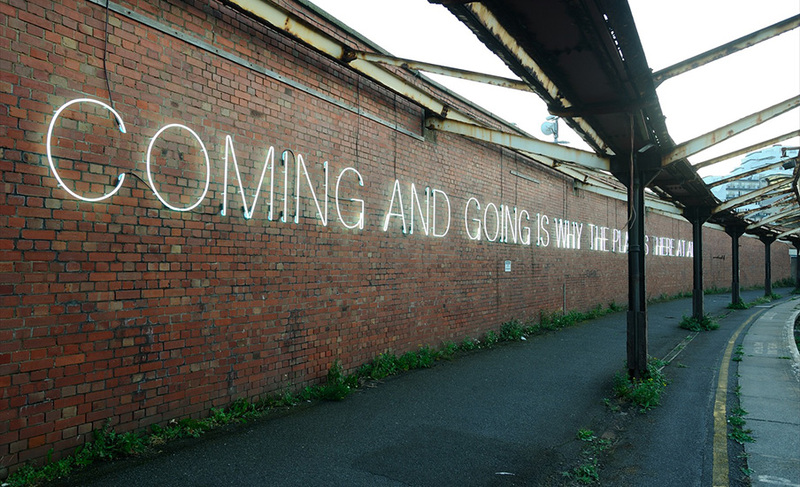 Tim Etchells’ work is diverse, extending across visual art, sound arts, performance, and creative and academic writing. In his performance and art practice, Etchells’ work is often concerned with liveness and presence, with the unfolding of events in a time and place. At the centre of many projects there is a fascination with rules and systems in language and in culture, and the way these systems are constraining. In addition, many works imply an opposed simultaneity – an event, object or idea that is at once assembled and unravelled. For Folkestone Triennial 2014, Etchells presents a work in the former Harbour Railway Station. The derelict site, where a work from the last Triennial is already placed, is extraordinarily evocative of its past, once swarming with travellers. Etchells’ work lines the curving platform walls of the station, left and right, with a large scale neon text that recalls and meditates on the station’s former activity and questions its future. The formal qualities of the site are reflected and amplified by the text itself to create a highly crafted poetic and poignant intervention. Etchells was born in 1962 and lives and works in Sheffield, UK. In recent years he has exhibited widely in the context of visual arts, participating in: Manifesta 7, Trentino (2008), Goteborg Bienale, Goteborg (2009), Aichi Trienale, Nagoya (2010), and Manifesta 9, Limburg (2012). He has had solo shows at Gasworks and Sketch, London, Bunkier Sztuki, Krakow, Galerije Jakopič, Ljubljana and Künstlerhaus, Bremen. Etchells received a major public art commission from Situations in Bristol in 2010 for two projects as part of the Wonders of Weston series and between 2008 and 2013 he was the recipient of The Legacy: Thinker in Residence Award, a joint initiative by the Live Art Development Agency and Tate Research.